Posted by plassaaj on Sunday, January 31, 2016 in Big Data, Neuroimaging, News. The Vanderbilt University Institute for Imaging Science (VUIIS) Center for Computational Imaging (CCI) has developed a database built on XNAT housing over a quarter of a million scans. The database provides framework for (1) rapid prototyping, (2) large scale batch processing of images and (3) scalable project management. The system uses the web-based interfaces of XNAT and REDCap to allow for graphical interaction. A python middleware layer, the Distributed Automation for XNAT (DAX) package, distributes computation across the Vanderbilt Advanced Computing Center for Research and Education high performance computing center. All software are made available in open source for use in combining portable batch scripting (PBS) grids and XNAT servers. 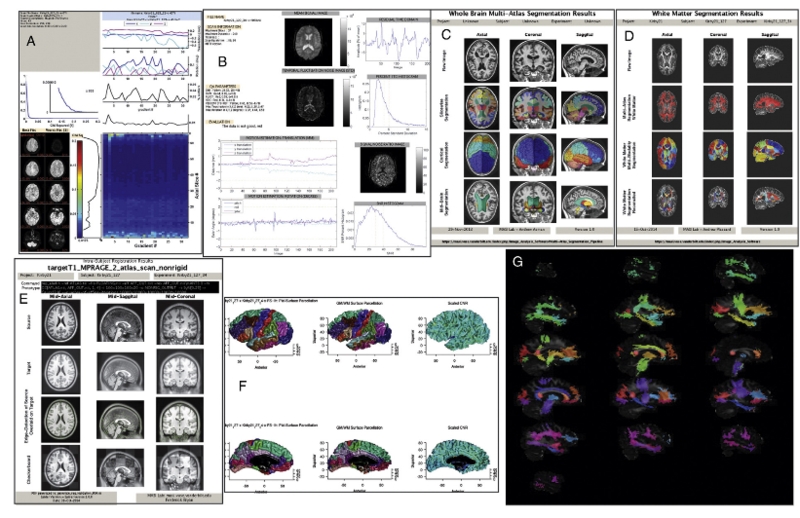 Quality analysis reports generally perform first level analyses, including diffusion tensor imaging (A) (Asman and Landman, 2013; Lauzon et al., 2013b; Lauzon and Landman, 2013; Papadakis et al., 2003; Whitcher et al., 2008), functional MRI (B) (Friedman and Glover, 2006), multi-atlas brain segmentation (C) (Asman and Landman, 2011, 2013; Ourselin et al., 2001, 2002), white matter labeling (D) (Plassard et al., 2015), registration to template spaces (E) (Fonov et al.,2009), FreeSurfer (F) (Fischl, 2012) and TRACULA (G) (Yendiki et al., 2011).